When I was in my mid-teens, one night, I was seized with the classic existentialist question: why is there something rather than nothing? It was a bit more complex, and the experience I had felt more like a frightening recognition than a question, but that was the heart of it: along with a sense of absolute certainty that there was no possible meaning to anything in life. It was as if I’d stepped out of our back door into the Void. Anyone who has been seized with this kind of questioning knows how overwhelming it can be. Those who haven’t been obsessed this way will probably scratch their heads and point out that the question itself hardly means anything. What possible answer is there? But that’s exactly the problem, when you are consumed by this overwhelming hunger to know “why” you are alive. I thought: that little sentence I’ve boldfaced pretty much nails it. That’s exactly what I went through. So for several years in my teens all of life seemed meaningless, pointless—but not depressing. I wasn’t depressed at all, not in any clinical sense. Good appetite, decent grades, went to the prom with Cindy Bethel. Got into college. But life seemed like Shakespeare’s tale told by an idiot . . . signifying nothing. I looked at everything, good and bad, beautiful and ugly, just and unjust, life and death, and I thought: what’s the point? Not because I was frustrated or disappointed. It was as if I’d been knocked completely out of all my ordinary frames of reference and was, in an anguished way, trying to remember what had once seemed so compelling about getting up in the morning. I had no urge to die, or otherwise escape this state of limbo, because I knew there was no escape. The escape would have been just as empty as what I was fleeing. It wasn’t that I was upset about injustice or America’s materialistic values or our involvement in a foreign war or how hard it was to make a left turn into the village Starbucks. (If there’d been a Starbucks back then.) Nothing made sense. Yet this is when I started getting serious about painting. A year or so earlier, I’d found some small starter oil paints my father had used and tossed aside, and I used them to create my own life-sized image of Jimi Hendrix to hang on my bedroom wall. I was the lead guitarist in a couple garage bands, and I had my idols. After discovering an article about Van Gogh in an Art News annual my parents had stored away on a shelf of our living room, I began to look at the act of painting as an end in itself. So, in these tentative baby steps, Van Gogh (and some reading of J.D. Salinger), aimed me down a path that led to Kierkegaard in my freshman year at University of Rochester and an “ah-hah” moment while reading The Sickness Unto Death about the nature of my questioning. It was like waking up, reading that small tract about despair, and yet what I recognized in Soren K.’s writing was actually supplementing what I’d been groping toward in my painting—it freed me from my internal mental struggle, allowing me to simply pay attention, rather than think. Painting became the central way I applied a new sense of hope that grew out of this practice of simply being aware: more humble, skeptical of my own limited interpretation of my own experience, dubious about my own dark predilections, always struggling to just see things as clearly and accurately as possible, without conceptualizing what I was seeing. I now saw the “problem of existence” as the Continental philosophers put it, as a problem of my own conscious mind’s limitations—a problem of my own narrow ability to intellectualize the nature of the world in its entirely, and the nature of my own spiritual state. My mind was blinkered by its own unacknowledged, yet extreme limitations and its own sense of purpose, rooted almost entirely in the need to physically survive. I was unable to detect these limitations hidden within my own certainties, because those same limits gave rise to those false certainties. It wasn’t a matter of knowing or learning more than I did. I didn’t need to hone my cleverness. It was about the limitations built into the act of knowing itself. Socrates, a man Kierkegaard greatly admired, recognized this when he claimed his unique wisdom resided in the fact that he was aware that he knew nothing at all. It isn’t a matter of stupidity or lack of learning, but the universal nature of the conscious mind itself. Knowing can’t get at what matters most: an inner, subconscious orientation that offers a sense of life’s meaning without ever letting you look directly at it and grasp it. That, more or less, was the crux of my insight. So painting became, for me, a fundamental way of “being in the world” as Heidegger might have put it. It was intentional, but it wasn’t purposeful. It wasn’t about anything other than the painting itself. It wasn’t about money or recognition or any outcome other than finishing the work: it was a way of reorienting my mind and myself. A way of “not knowing.” I had another lunch with A.P. Gorney recently at the Albright-Knox in Buffalo, and we disagreed about a number of things and actually found some common ground in others, as usual, and at one point he lamented the “professionalization” of art. I brightened at that and said: “I totally agree. It’s why I avoided art school when I was in college. The idea of making it a job, or a career. A career? It’s an obsession, an affliction. A way of seeing. Not a job.” Then he started telling me about Wittgenstein, and I learned some thing but it didn’t clarify, for me, why I’m painting so diligently. 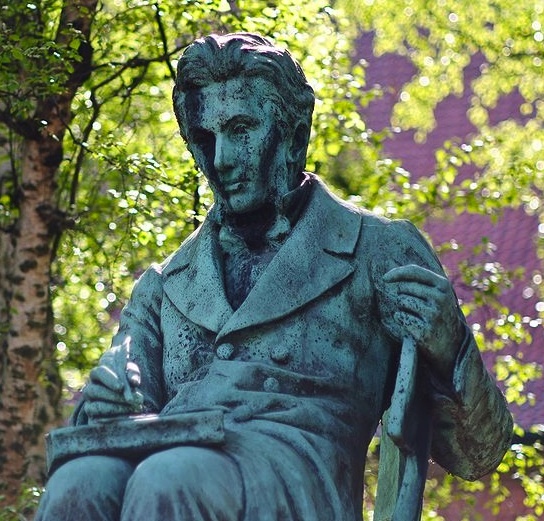 Wasn’t Kierkegaard very clever? But also exceptionally deep. I think we all like cleverness, anyway; just not out of balance and over-running everything, like those Chinese carp in the Ohio River. Here’s a good thought from Kierkegaard that sort of ties all this together, if we let cleverness and irony be interchangeable: “In an age dominated by irony, the most ironic stance is to be unironic.” Kierkegaard was a big fan of irony but saw its dangers, or maybe he just liked to have the last laugh, or outmaneuver everyone. He also declared that the most common form of despair was not knowing you despair, which makes it a little easier to handle being in a college where everyone else seems to be having more fun. A real artist is the one who has learned to recognize and to render… the ‘radiance’ of all things as an epiphany or showing forth of the truth. The artist is meant to put the objects of this world together in such a way that through them you will experience that light, that radiance which is the light of our consciousness and which all things both hide and, when properly looked upon, reveal. What the artist must render is a living moment somehow, a living moment actually in action or an inward experience. We’re so engaged in doing things to achieve purposes of outer value that we forget that the inner value, the rapture that is associated with being alive, is what it’s all about. I thought it was interesting that Kurt suddenly brought up Campbell because I had also invoked Campbell’s work over lunch with Gorney, saying that his effort had been to find the common foundation of all human experience, across cultures, in the similarities among the myths around the world. Gorney said, “The postmodernists hate him, don’t they?” I said I certainly didn’t know one way or the other, but it would make sense if they did, since postmodernism seems to be built on the assumption that there is no absolute truth across culture, that all human experience is simply the accidental product of cultural forces, with no lasting spiritual core. Campbell’s vision of life as a transformation of consciousness, a way of putting the conscious mind in its proper place as a a servant of the whole human being, rather than the master—that is eventually what I took out of the crisis of my teens and my pursuit of painting. Porter: . . . The artist doesn’t know what he knows in general; he only knows what he knows specifically. And what he knows in general or what can be known in general becomes apparent later, through what he has had to put down. You are not quite in control of nature; you are a part of nature. It doesn’t mean that you are helpless, either. It means that the whole question in art is to be wide awake, to be as attentive as possible, for the artist and for the person who looks at it or listens to it. . . .the Platonic notion that what is real is an idea, that is not what is real. Plato is wrong. What is real is not an idea, it is not that; it’s specific and it’s total, it’s both specific and total. And I once said that at Kent State University. There I was on a panel with these other artists in which we also talked to philosophy students. That was what I said to them: that Plato is completely wrong, that art is not ideal, it’s material and specific and actual. It’s not an idea. Do you think that painting is more of an emotional expression than an intellectual one? Porter: No, I don’t think it’s more emotional or more intellectual. I think it’s a way of making the connection between yourself and everything. You connect yourself to everything that includes yourself by the process of painting. And the person who looks at it gets it vicariously. Sounds like I need to pick up some Soren K.
Always good to read Mr. K, Grace. This entry is filed under Uncategorized . You can follow any responses to this entry through RSS 2.0 . You can leave a response, or trackback from your own site.